Kinetic Solutions Intl, Inc. shows a prototype Simplex Aerospace Water Cannon driven by an Exlar GSX actuator and SLG motor. 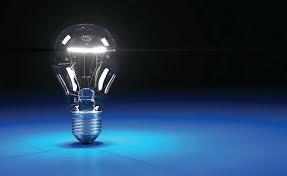 What is the best approach for your electrical system? For more details, check it out here! Ever wondered which actuators are the best option for your application? Premature Damage to Actuator Bearings? Are you hearing unusual noises or seeing blackened grease leaking out of your pulley housings resulting in unplanned machine downtime? If you are, you’re not alone. Your actuator may be degrading due to a phenomenon known as electrical discharge (ED). Stray electrical voltages are traveling from motor shafts through couplings, pulleys, bearings, and housings in a search for ground. Since ball bearings are rolling contacts with lubricant between surfaces, the voltage arcs the gap and causes material erosion, lubricant failure, heat, and ultimately premature bearing failure. This damage can reduce the life of bearings that should last 6 to 10 years to as little as 2 to 6 months. Your root cause investigation should focus on the motor grounding system as voltage discharges as low as 3.2 volts will cause current discharges across a ball bearing and raceway lubricant gap. Electrical Discharge Machining, sometimes called “spark machining” is a common manufacturing process where material removal is done by triggering a rapidly recurring current discharge between two electrodes separated by a dielectric liquid and subjected to an electrical voltage. One of the electrodes is the part being machined and the other is the “tool” electrode, typically a wire or carbon shape. The gap between each electrode is precisely controlled and the dielectric liquid fills this gap. 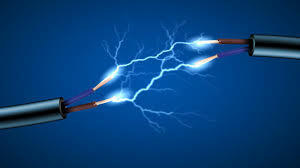 As voltage is applied and increased, the intensity of the electrical field in the gap rises and becomes stronger than the dielectric liquid, allowing current to flow or arc across the gap. As a result, material is removed from each electrode and carried away by the dielectric fluid. Performing this arcing at a high frequency results in an efficient erosion machining process that is very good for hardened materials. Whereas EDM is a practical manufacturing process, it is not desirable in Motion Control systems and applications. How do you recognize Electrical Discharge? At first, the continuous arcing will start pitting the bearing raceways and reduce the ball diameter. Ball retainers will also start eroding and break apart. The heat builds due to arcing and friction causing the grease lubrication to breakdown and become contaminated with metal particulate. Blackened grease may leak out of the bearing and be visible on the pulley housing and pulley shaft. As the bearing degrades and becomes unlubricated, heat and friction build causing metal to metal contact noise. If the actuator drive shaft is decoupled from the motor, you may feel a roughness or bumpiness when rotating the drive shaft. The electrical discharge continues and works its way to all the bearings in the actuator as these are the points of arcing. 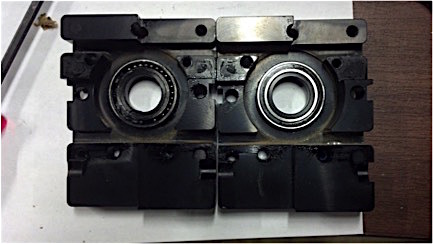 As the bearings degrade (balls, retainer cage and polymer seals disappear) and become non-functional the actuator will begin running erratic and make significant noise. In a fully catastrophic case there are no bearings remaining and the pulley is unsupported, the actuator timing will be compromised and other parts of the machine system will be affected. Here is a Stage 2 ED-damaged drive pulley housing that has been disassembled. 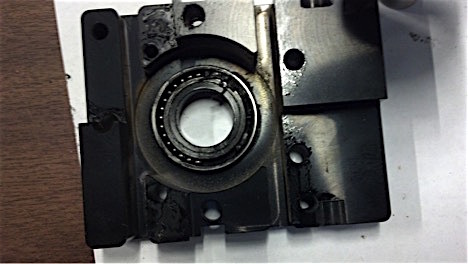 The shaft-side bearing (left) shows no seal, blackened lubricant and damaged ball cage. The pulley housing and bearing (right) show no visible damage but the bearing rotates with a rough feel indicating Stage 1 damage. Measure actuator pulley housings and shafts for a voltage using an Oscilloscope or an Electrical Discharge Pen TKED1 made by SKF. Presence of voltage is a good indicator that ED is contributing to the failure. Check all drive system ground connections and cables for proper ground bonding and shielding. If inconsistencies are found, correct and recheck for voltages. Measure temperatures of the motor, adaptor and pulley housings for excess heat generation. Hot spots may indicate failure point. Fruit packaging application using a Macron Dynamics MSA-BT Thruster, and an Exlar Tritex II Motor. Assembled and supported by Kinetic Solutions, Intl. A convection oven utilizes a stirring fan to circulate heated air which substantially reduces cooking time. The customer was purchasing an expensive drive manufactured in Europe which they desired to replace with a low cost drive manufactured in the USA. In the application, the drive receives serial communication commands from a PLC that provides the user with various cooking recipes. A standard drive could not be used because the communication protocol, although similar to Modbus, was unique and proprietary. The low cost KBVF Series VFD, with the DIDF Serial Communications Module, was chosen for this application. KB engineers were able to decode the proprietary serial communications protocol and reprogram the standard DIDF Communications Module. The result was exactly what the customer desired-a low cost VFD assembled in the USA with proprietary serial communications. Palletizer machines have become an essential part of automation, replacing human error and injury in manufacturing with efficiency and speed. In addition to such benefits, palletizers can handle environments that would otherwise be injurious to workers. Instead of requiring the hire of more laborers to do this work, many companies have adopted palletizers into their workplace environments in order to get the job done more quickly, effectively and safely. RADFORD, Va. – Nippon Pulse America Inc. (NPA) is pleased to announce that its Virginia-based sales office has been approved for ISO 9001:2008 and 14001:2004 certifications by BSI America. BSI certified NPA for both Quality Management and Environmental Management under ISO’s international standards. NPA joins over 1 million companies and organizations worldwide to be certified under the 9001 standard for Quality Management, which allows companies to ensure consistency and continual improvement in products and services. The 14001 standard allows NPA to measure and improve its impact on the environment through the creation of a certified Environmental Management system. Many of NPA’s products are manufactured in Nippon Pulse factories located in Japan and China, all of which have previously received both the ISO 9001:2008 and 14001:2004 certifications. As a sales-based office, NPA chose to work toward the certification as a commitment to providing customers with the highest quality service, and to reducing its impact on the environment. The Exlar® FT Series actuators combined with a parallel motor mounting configuration use a polymer reinforced belt drive system. The drive train does not require any lubrication and any oil or dirt contamination within the belt drive system will decrease belt effectiveness and life. The belt and pulley system should be inspected periodically for excessive wear and proper tensioning. Do not remove the belt cover while the actuator is operating. Always remove power from the attached motor before removing the belt cover to service any component of the drive train (i.e. belts, pulleys, bushings, inline couplings, gears, etc). Failure to do so can result in damage to the actuator or cause serious injury to the operator. The following picture is only an example of a typical belt and pulley drive train in an FT Series actuator. These belt drives do not require as much tension as other belt drives that depend on friction to transmit the load. The installation procedure should begin by installing the belt with a snug fit, neither too tight nor too loose. Now, measure the belt span, (t), as shown in the picture above. With one pulley free to rotate, use a spring scale to apply a perpendicular force to the center of the belt width at the mid-point of the belt span. For belts wider than 2”, it is suggested that a strip of keystock, or something similar be placed across the belt under the point of force to prevent distortion. Measure the deflection of the belt at the mid-point. While applying the correct force, there should be 1/64” of deflection for each inch of belt span. For example, the total deflection for a 32” belt span is 32”*1/64” = ½”. The appropriate amount of force for each belt is shown on the customer approval drawing, or you may contact our application engineer team for assistance.